The 2019 Michigan football team will kick off spring ball on Sunday and it couldn’t come soon enough after another tough finish to the 2018 season. But the clouds are parting and though there are plenty of questions to get answered this spring and summer, this is another talented squad that could do big things. 1. Will #SpeedInSpace Actually Take Flight? Though all signs and reports and comments point to it happening, there’s will always be the “won’t believe it until I see it, bro” people out there. And to be honest, I’m a bit like that too, bro. It’ll be far from completely implemented through spring ball but I do fully expect things to be opened up quite a bit by new offensive coordinator Josh Gattis. But Jim Harbaugh is still a Harbaugh and Michigan is built to be able pound the rock. So don’t get too upset when you see power football and multiple tight end sets at times. It’s gonna happen. Question is, how much? 2. Will There Be a QB Controversy? Of course there will be a quarterback controversy within the fan base but will there be a legit one within the coaching staff by the end of spring ball? Shea Patterson returns for his final year of eligibility and is the #1 guy on the depth chart. But Dylan McCaffery and Joe Milton flashed what they could bring to the position in 2018 and both will be pushing Patterson throughout the spring, summer, and fall. With a new offensive coordinator in town, everyone will have their chance. Expect Patterson, McCaffery, Milton and even early enrollee freshmen Cade McNamara to show out during spring practices. Question is, will that final year push and the opened up offense bring out the best in Shea? I believe so and I think the push from both is NFL prospects and teammates will get him there. This is the most talented, high ceiling quarterback room Michigan has had in decades. I don’t believe there will be much of a “controversy” but this battle will be one to watch all spring and summer and will likely carry well into the season. 3. Will it Be Zach at Starting Running Back? The news of Chris Evans’ suspension from the football team really put a huge question mark on the running back position. Only two running backs return that had any significant carries in 2018 in Tru Wilson and Christian Turner. Turner received plenty of hype throughout the bowl season but the former walk-on, Wilson is the one with the most experience. While I like both and think they’ll get the most reps during contact periods, it’s the early enrollee freshmen Zach Charbonnet that everyone will be watching. The top-50 overall recruit and crown jewel of Michigan’s 2019 class is the next hyped up signee with sky high expectations. Though I wouldn’t expect the world this spring as he is coming off a minor knee injury, I do think he’ll impress in whatever amount of time the staff allows him to play. If he’s as good as advertised, a trio of Charbonnet, Turner, and Wilson could be a dynamic, balanced attack for the Wolverines this fall. 4. Who Will Fill the Defensive Voids? Bush, Gary, Winovich, Long, Kinnel, Mone, Solomon, Furbush, Watson. That’s a lot of contributors to lose off of an elite level defense. But Don Brown didn’t flinch after losing eight guys off of the 2016 defense. The talent is there. With the loss of Bush, you have Josh Ross and Jordan Anthony filling the role. Detroiters Ambry Thomas and Vincent Gray will battle it out to replace long (but look out for Myles Sims and Sammy Faustin). Carlo Kemp and Michael Dwumfour weren’t consistent in 2018 but with the interior of the line up for grabs, they should see a ton of playing time. Losing two NFL draft pick defensive ends? Josh Uche, Kwity Paye and Aidan Hutchinson showed everyone why the production drop off shouldn’t be much at all. What will CMU transfer Mike Danna bring to the line? And can you get the likes of Luiji Vilain and Donovan Jeter make the impacts they have the talent to make? Two guys I think should make big jumps into leadership roles will be Josh Metellus and Devin Gil. Both are in their senior years and need to lead this defense if it’s going to be elite again. This defense won’t show everything during the spring but it will be interesting to see who is getting the most run with the ones and which young guys start to make an impact. Don’t sleep on Cam McGrone and Julius Welschof either. 5. Who Will Play on the Opposite Side of Hill? The soon-to-be senior Lavert Hill is the obvious starter on one side while junior Ambry Thomas will be the early favorite to play opposite of him. But it’s far from his spot. There are several options but there isn’t an up and comer that received more love in practice during the 2018 season and bowl season than Vincent Gray. Other names to watch closely are Myles Sims and Sammy Faustin, with Gemon Green being a darkhorse option. He’s a guy that could find his way into the two-deep at slot corner. 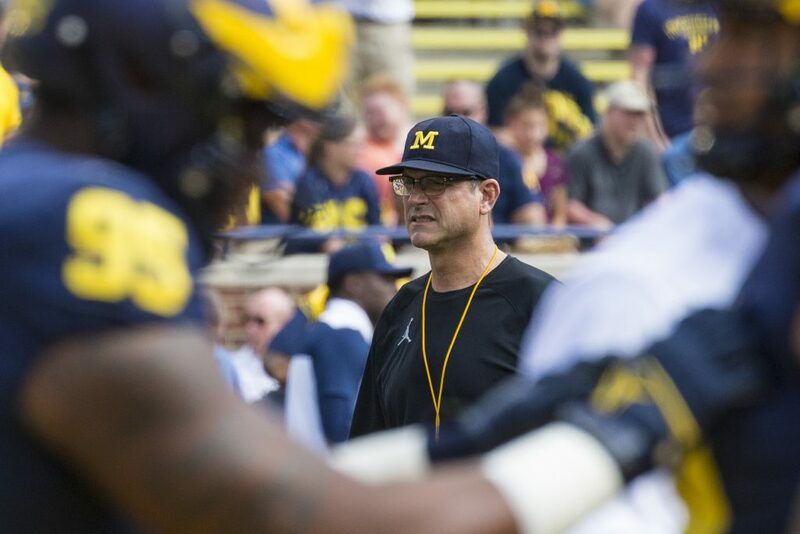 How are you feeling about the Michigan football team heading into spring ball? Let us know in the comment section below!